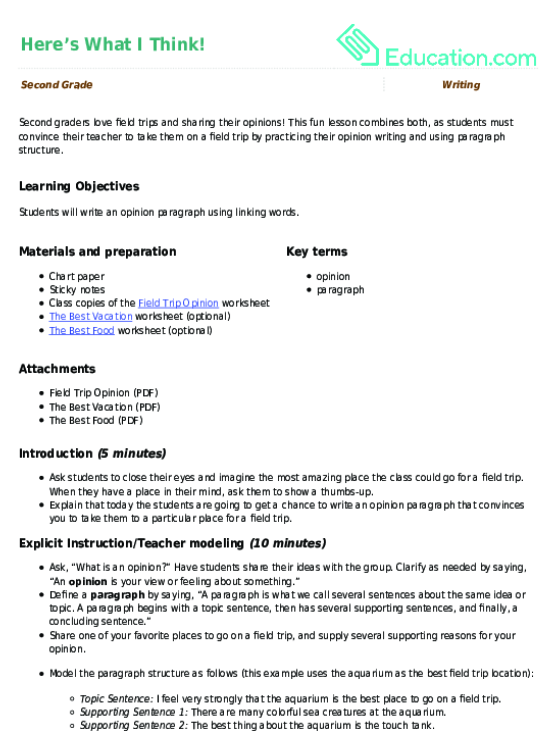 Students will write an opinion paragraph using linking words. Ask students to close their eyes and imagine the most amazing place the class could go for a field trip. When they have a place in their mind, ask them to show a thumbs-up. Explain that today the students are going to get a chance to write an opinion paragraph that convinces you to take them to a particular place for a field trip. Share one of your favorite places to go on a field trip, and supply several supporting reasons for your opinion. Topic Sentence:I feel very strongly that the aquarium is the best place to go on a field trip. Supporting Sentence 1:There are many colorful sea creatures at the aquarium. Supporting Sentence 2:The best thing about the aquarium is the touch tank. Supporting Sentence 3:Also, the aquarium is interesting because you can learn facts about many animals. Concluding Sentence:If you love animals, you will love going to the aquarium, too! Explain that you just wrote a paragraph where you gave an opinion and supplied your reasoning for the opinion using supporting sentences. Ask students to share out where they think the best field trip locations are. Have students choose one location from the board and discuss with a partner one reason the location is the best. Have them write up their reason on a sticky note and then attach to the chart by their location. Model taking one of those locations and the associated reasons and turning it into a paragraph with help from the students. Point out the use of linking words such as “because” and “also” in the model paragraph. 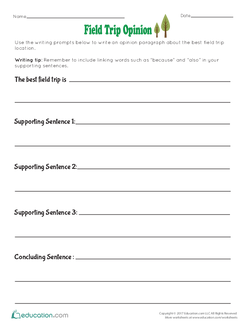 Pass out the Field Trip Opinion worksheets and have the students use them to create their own paragraphs. 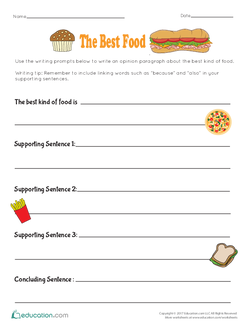 Provide students with sentence frames to use while writing their opinion paragraphs. Sentence frames can be pre-written on the board using sentence strips, or copied for individual use. For advanced students who finish early, have them complete the The Best Food and The Best Vacation worksheets. Collect student work samples to assess whether students are able to include all parts of a paragraph and are able to share an opinion. Invite 2-5 students to share their opinion paragraph with the class. Ask students to think about whether they are convinced that each speaker's field trip location is the best as they listen to the work samples read aloud. Close by telling the students you will carefully read over each paragraph and consider each field trip location carefully. Up, up, and away! Kids love to explore new places! Use this awesome travel writing template as a launching point for your students to hone their writing and editing skills. With this worksheet, students will think about something they would like to see changed in the world. Provide them with this graphic organizer to organise their ideas.